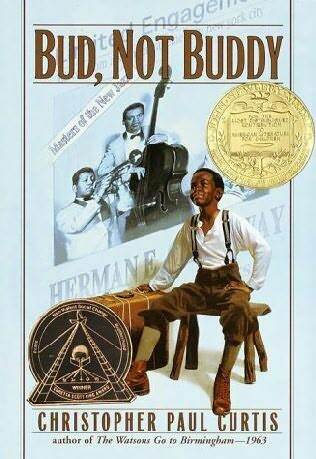 Bud, Not Buddy by Christopher Paul Curtis was the 2000 Newbery Medal winner, but because it was published in 1999, while I was still in high school and not yet interested in children’s books, I never got around to reading it. Finally, though, it was snowing one day, and the library was slow, so I yanked a paperback copy from the shelf, and whipped through it in one sitting. Bud Caldwell is ten years old, and living in Flint, Michigan, in 1936. His mother's been dead for four years, he doesn't know his father, and after a brief, disastrous stay with a foster family, he's "on the lam" and looking for a place to go. Convinced that concert flyers kept by his mother, advertising performances by Herman E. Calloway and the Dusky Devastators of the Depression!!!!!! are clues that will lead him to his true father, he sets out for Grand Rapids, looking for home and family. The strength of this book is in the writing. Christopher Paul Curtis is very careful with his words, and each one is placed exactly where it belongs. His style is deceptively simple, but packs a definite punch. I aimed the gun at the stove and pretended I was shooting at a elephant or a dragon or a tiger, or best of all, Todd! I imagined how it would feel to creep up to his bed while he was sleeping and put the shotgun barrel right in his nose. After that I'd have to do some quick moving to get the grown-up Amoses. Unless they were real sound sleepers the shotgun going off in Todd's room would give them a clue that something was going on. That’s pretty darn powerful for such a short passage, and of all the descriptions of Bud’s life that we get in this book, I think this one tells us the most about his dire situation. He’s living a life where shooting an entire family is one of the options for survival, and it’s only because of the kind of kid he is, a good kid with a good heart, that he doesn’t follow through. And his self-awareness, the knowledge that he has to get the gun out of the way to avoid taking that chance - that was chilling. Literally. It gave me chills. And maybe I’m sick for saying so, but I kind of wanted more of that intensity and stress, and less heartwarming stuff. I know this is a children’s book, and maybe it wouldn’t have been appropriate to explore the creepy dark side of everything, but after reading Harry Potter and so much dystopian stuff, I felt almost too jaded to appreciate this book without a little more pain and suffering. I’m not saying I’d have Bud load a gun and shoot it, but I would have liked to see more of what his life was like before he left for Grand Rapids and things started to look up. I wanted more emotion, and for the entire middle of the book, I just didn’t feel much. But all was not lost. I definitely found something to love about this book, and that was the time Bud spends in the public library. I am usually annoyed by the depiction of libraries as sanctuaries for troubled kids in fiction, because while I obviously know a fair number of kids who see the library that way, there are also many more kids who don't go running to the library for asylum, and never would. But I think the logic here makes sense. The library is a place Bud's mother took him, so he returns there now to remember her, and to maintain some sense of routine and normalcy. And because he is familiar with libraries, he also knows this is where he can gain information about traveling to Grand Rapids. And, thankfully, Bud's reaction to librarians isn’t super warm and fuzzy, and it made me laugh. That is so true. We all do it. We can't help ourselves. "And when you're done with the book bring it back and I have something special for you!" She had a huge smile on her face. Curtis has obviously spent some time in libraries. That made me chuckle. All in all, I’m glad I filled in this gap in my reading An excellent book which is certainly deserving of the Newbery it was given. This was a wonderful review. I have already added it to my TBR list. Some books are just like that - they grab you immediately and don't let go. I recently read Anna and the French Kiss in one night - couldn't put it down LOL! You want more emotional? Try Curtis' Elijah of Buxton. It has a happy ending, but it's really bittersweet and I think I spent the last 20-50 pages of the book sobbing. My son being 6 months old at the time made the situation feel more immediate (there's a baby, and I won't say more without giving it away), but I think it's got enough gut-wrenching for just about anyone. It's funny to me that you would feel that books are too light-hearted after reading a lot of dystopias--I read a few of those and NEED some warm and fuzzies to recover! I agree that Bud had it pretty easy, but he's such a funny narrator that I guess I didn't mind too much. I read this with a kids book club and they mentioned the same thing. This is so awesome! I came to your blog through Lee Wind's and I love your aesthetic!! Also, I live in Michigan, have my whole life, and I am thankful you blogged about this book. Your review is excellent and I will pick up BUD, NOT BUDDY ASAP. I love Bud Not Buddy but I also really like your take on it.